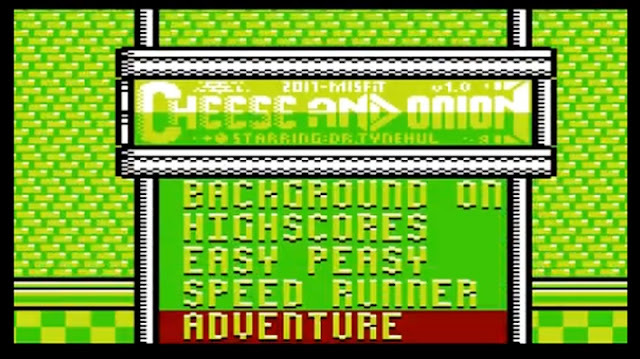 Indie Retro News: Cheese And Onion - There's no crisps in this commercial VIC-20 game! Cheese And Onion - There's no crisps in this commercial VIC-20 game! VIC-20 owners are you feeling left out? Well worry not! As if you've got the cash, Misfit, The Future Was 8bit and Tynemouth Software have announced 'Cheese And Onion' for the VIC-20 which is ready for your pre-orders and hope to be shipped within the next 2-4 weeks! This charming little game staring Dr.Tynehul, features lots of platforming fun as you jump over enemies to collect items all the while admiring the impressive scrolling! Cheese And Onion is being developed by our good friend Misfit, who was also behind games such as Pilot Attack, Dork Dave And The Dirty Trick, Mr Angry Dude, and our personal favourite Pentagorat. According to the developer, this new game which is due soon will feature 3 game modes and 4 worlds of gaming fun!